The Hisense 43H6D offers a sharp 4K picture with HDR support at a sweet low price, but display-quality issues and a meager app selection hold this set back. 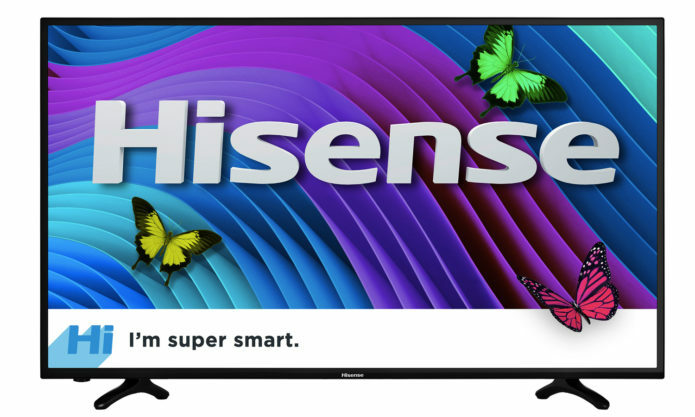 The Hisense 43H6D is a 4K Ultra HD TV, but don’t assume it’s out of your price range. The 43-inch Hisense offers smart-TV functionality and HDR for less than $500 and is the sibling to the Hisense 43H7D that we included in our roundup of the best inexpensive 4K TVs. While this TV may not offer all the polish and features of more expensive 4K sets, it still delivers as a smart TV with 4K resolution and HDR support, and does so at a price that’s easy to stomach. The Hisense’s chassis measures 38.1 x 22.1 x 3.4 inches, with plastic construction and a boxy design. With the stand attached, the set actually measures 7.5 inches deep, but VESA mount-compatibility means you can hang this set on a wall just as easily as you can set it up on a table or shelf. It’s not as svelte and stylish as a premium set, like the Samsung Q7F, but the utilitarian design gets the job done. On the back and left side of the set, you’ll find four HDMI ports, three USB ports (two USB 2.0, one USB 3.0), an Ethernet port, an RF connector for antenna, and both component and composite video. Even with a box for cable or satellite, a Blu-ray player and a game console, you should have ample connections available for anything else you want to connect to the set. With built-in Wi-Fi, you can get online for streaming content without running a networking cable across your living room. The Hisense 43H6D 43-inch display uses an edge-lit LED panel with low (but tolerable) brightness, registering a maximum brightness level of 296 nits in our lab testing. Bright colors came through clearly, whether the set was playing back 4K content from a UHD Blu-ray or upscaling over-the-air channels from an antenna. Animated M&M’s popped in a TV commercial, and the rainbow-hued suits of the Power Rangers looked good in 4K. The set offers high dynamic range (HDR) processing, but the option is buried in the user settings and called Dynamic Backlight Control instead of the more standard terminology. The 43H6D supports both Dolby Vision and HDR10 formats, but with less than 300 nits of brightness, the effect was minimal. However, the lack of uniform backlight illumination across the panel overshadowed the newer standard. Regardless of the material we viewed, unwanted shadows were frequently visible along the top and bottom edges of the screen, and the corners of the 43-inch panel were always dimmer than the rest of the picture. Conversely, the right and left edges of the screen were often over-illuminated, with noticeable flaring visible when displaying black backgrounds. The 43H6D’s color accuracy is fairly good, as the set registered a Delta-E rating of 2.4 (closer to 0 is better), which is better than many budget 4K sets achieve. The Westinghouse Amazon Fire TV (5.5) and the LG 43UJ6300 (4.5) both fared worse, while the TCL Roku TV (2.2) was quite similar similar. The Hisense also produced 98.7 percent of the Rec. 709 color space; we consider anything close to 100 percent or higher to be quite good. Black levels, on the other hand, frequently overwhelmed shadowy details. Black portions of Deadpool’s suit, for example, were inky-black, losing the fine folds and creases seen in other sets. The 43H6D produced surprisingly good bass for a system without a subwoofer. The 60-Hz refresh rate on this set is disappointing but expected, and Hisense’s use of Motion Rate 120 pushes this set to an effective refresh rate of 120 Hz. While we prefer true 120 Hz or higher, especially for watching sports, you aren’t likely to find that rate at this price. Still, there was none of the flickering that I saw on the similarly priced Hisense 43H7D or the Westinghouse Amazon Fire TV, even though I’m fairly sensitive to it. There was a bit of a screen-door effect when some tightly patterned details moved across the screen, and images of a chain-link fence nearly shimmered when the camera panned across the scene. Turning on digital noise-reduction slightly improved the issue but didn’t solve it. When I listened to the Foo Fighters’ “The Sky Is a Neighborhood,” the 43H6D produced surprisingly good bass for a system without a subwoofer. The 43H6D’s two 7-watt speakers produced enough volume to fill a living room, and song lyrics were mostly clear, though some sounds were a bit muddied. Preset sound profiles let you choose from among Standard, Theater, Music, Speech and Late Night modes. The Hisense supports Dolby Digital surround sound, with a digital-optical output for 5.1 speaker systems. The 43H6D has no Bluetooth support, so you don’t have that option for wireless headphones or speakers. While many smart-TV manufacturers are simplifying the remotes for their function-filled sets with minimalist, wand-style designs, Hisense has made its remote bigger and crowded with number buttons, channel and volume controls. A square ring of arrow buttons lets you navigate through menus along with buttons for home, back and exit. Dedicated buttons for Netflix, Amazon, Vudu and YouTube let you jump straight into streaming apps. The remote has 44 buttons in all, as compared to seven on the remote for the Samsung Q7F. More-esoteric features like voice search or gesture control are nowhere to be found, but the one missing feature that felt like an oversight was backlighting. If you’re going to give someone a remote with 44 buttons, then a bit of illumination – whether an LED backlight or just glow-in-the-dark labels – would be helpful. I could see myself frequently fumbling as I try to figure out which black button is which on the black, plastic remote, especially after dimming the lights to enjoy a movie. Hisense uses the Opera TV operating system for the 43H6D, instead of a more popular interface, like Roku or Android TV. The menu layout is simple and easy to navigate, with a single row of menu items coming up when you hit the home button and a simple grid menu for things like input selection or apps. Getting around with the directional buttons on the remote is very straightforward. You can choose from a handful of popular app options like Netflix, Amazon Video and YouTube, but there are fewer than 30 apps total. You won’t find many common streaming services, like Hulu, Crackle or Crunchyroll. Music apps are similarly hit-and-miss; you’ll get Pandora and iHeart Radio, but not Spotify. While it’s impressive that the Hisense 43H6D offers 4K HDR for less than $500, the affordable price comes with its share of caveats. Some are expected, like the bulky design or the fair but not fantastic audio quality. Others are unwelcome surprises, like backlighting that’s far from uniform and screen brightness that’s dim enough to blunt any benefit from HDR. And while this set does come with several popular apps preinstalled, other common services are nowhere to be found, leaving the Hisense 43H6D feeling a little dumber than most smart TVs. On the whole, it’s a bargain for a 4K set, but the caveats might put you off regardless of the price. For a better budget Ultra HD TV, look to the Insignia Roku TV NS-55DR620NA18 or the TCL Roku TV 55P607, which both offer Roku’s richer app selection and require fewer compromises in display quality.